﻿ Using Stones for Personal Growth. Blue Lace Agate: Foresight. 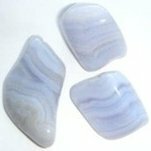 Blue Lace Agate is a light blue, banded chalcedony composed mainly of microcrystalline quartz. Its name comes from the translucent bands of light blue and milky white displayed on the stone's surface in a beautiful and sometimes subtle lace pattern. The bands are formed in siliceous volcanic rock by layered crystallization within nodules. The most well-known agate deposits are in southern Brazil and northern Uruguay. The crystalline structure of Blue Lace Agate interacts with your personal energy to strengthen Foresight. Foresight is the ability to look ahead to figure out what is most likely to happen. It is being able to recognize the most likely outcome in a situation. Foresight comes from being good at weighing probabilities and then figuring out what the chances are that particular things will happen. If you are good at weighing the probabilities in a situation, you are likewise good at knowing what to expect. It is said that "hindsight is always 20/20", but if you are good at weighing probabilities, foresight can also be 20/20, or close to it. There are two main factors that contribute to foresight. The first is being able to accurately weigh the probabilities in a situation. This is the doing side of the duality. The knowing side is knowing what to expect as the most likely outcome in any situation. If you are good at knowing what to expect, that is, knowing what is most likely to happen, you also know whether or not it is useful for you to put energy into trying to make it happen. The doing and knowing side of foresight work together as a duality, and together they build realistic expectations. The reason for weighing probabilities is to predict what is reasonable to expect. When you know what to expect, you also know where to put your energy to make it work well for you. For example, if you put a great deal of energy into a project or a relationship, and later find out that it hasn't turned out at all as you expected, you have wasted the energy you put into it. The energy is wasted simply because something that at first looked promising didn't work out. If you had known what to expect in the first place, you would not have put the energy in initially, and you would not have ended up feeling disappointed. If you have trouble knowing what to expect in situations, you constantly expect what is not reasonable to expect, and you often end up being disappointed. Reality never seems to quite live up to your expectations, because what you anticipate tends to be better than the actual results that follow. Often, the positive things you expect to happen never come to pass, and this is very hard on your enjoyment of life. It can sometimes make you feel as if your life is totally out of control. Also, you tend to be afraid of things that are unpredictable because you don't know how to handle them. Experience is the best teacher for becoming better at knowing what to expect. The key to learning by experience is to think about the difference between an outcome you initially expected and the outcome that actually occurred, and anticipate that a similar thing may happen again later in much the same way. By doing this over a period of time, you start to see the patterns connecting cause and effect in different areas. When you become good at drawing the connection between what is happening now, and what is going to happen later as a result, your foresight increases dramatically. Another key to developing more realistic expectations is to become aware of what information you need in particular circumstances, what information is relevant and useful and will allow you to figure out what to expect. Having the right information at the right time is a powerful tool for gaining foresight. If you know what information is worthwhile and important to have, then you can go after that information and use it to gain the necessary foresight. You can also enhance your foresight by learning to prioritize the use of your energy. This means being able to look ahead and figure out what is most important, what is most pressing and needs your attention right now. Prioritizing makes you anticipate what is most likely to happen, so you can deal with it. It helps you see how best to handle things. By anticipating potential outcomes in this way, not only do you become better at dealing with what it takes to make your life run smoothly, but you also sharpen your foresight. Foresight is also improved by exploring alternatives, by being able to see the different paths or means to an end. This not only helps you find the best way to do something, but it also makes you aware of the many ways of doing things, and is its own type of foresight.